The model number can be found on the label that is located on the underside of the foot rest. 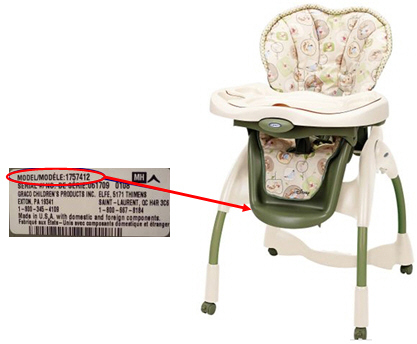 The recalled products were manufactured from November 2003 to December 2009 and are no longer in production. The screws holding the front legs of the high chair may loosen and fall out, and/or the plastic bracket on the rear legs may crack causing the high chair to become unstable and tip over unexpectedly. This poses both fall and choking hazards to children. In Canada, Elfe Juvenile Products has received 3 reports of minor injuries, such as bumps, bruises and scratches, resulting from the high chair tipping over while a child was seated in the chair. Health Canada has not received any reports of incidents or injuries related to the use of these high chairs. Approximately 39,000 units of the recalled high chairs were sold by major and independent retailers across Canada. 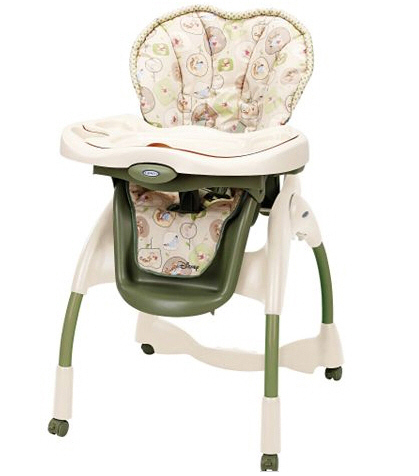 The recalled high chairs were sold from December 2003 to February 2010. Consumers should immediately stop using the recalled high chairs and contact Elfe Juvenile Products to receive a free repair kit. Consumers are please asked to not return the product to the place of purchase.